Just what kind of gaming bliss will the SMOS bring to your Android-powered handset? For starters, it comes equipped with 18 different configurable keys, a couple of thumbsticks, D-pads, as well as two paddles. Not only that, you will be able to enjoy an array of buttons that will deliver ultimate control no matter the game genre that you love indulging in. 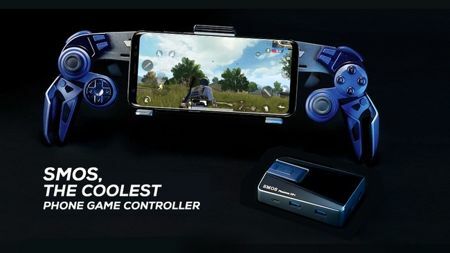 This high quality gaming controller is more than capable of handling the latest Android mobile games, and the SMOS hopes that it will be able to provide a similar arcade or high quality console experience. Boasting of universal game compatibility, the SMOS will work on your Android-powered smartphone without the need for rooting or modifying your handset. In essence, SMOS delivers plug-and-play simplicity so that you may be able to dive into mobile gaming action on the spot. The high quality, precision, mechanical keypad, and control design makes gaming sessions a pleasure, with the thumbsticks boasting of similar quality levels to that of Sony’s PlayStation courtesy of the same ALPS sensor that stars in Sony’s controllers. As for its buttons, there is advanced circuitry that delivers instant reaction without any dreaded lag time so that you will always be on top of your game. Comfortable, ergonomic, and designed for maximum efficiency, what more can a mobile gamer ask for?